"Seeking out new emotions, sensations, capturing them and savouring the joy of those who come to drink them in. ... that is real happiness for the painter, because it's the end of a long journey which passes through joyful moments but, also despondency. Yet what bliss to be able to say we have arrived, we have found our path: to share what is deep within us, and offer it to others…! " Christiane Keeping. After studying at the Fine Arts schools of Metz and Avignon, Keeping worked with great masters: Joseph Alessandri, the painter in Saint Remy and Luszpinsky. She has not neglected any art form, from the abstract to more figurative techniques including model building. Today, her powerful and vivid painting reflects this long journey through the range of techniques which have led to her works being exhibited in several galleries and exhibitions across Europe. 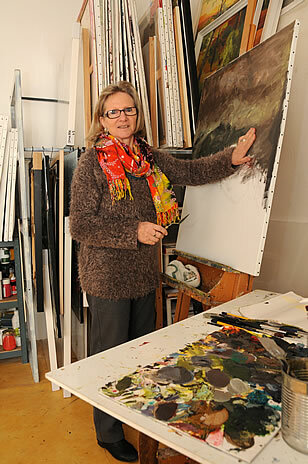 Based in Rousset les Vignes in Drome Provençale, this authentic, welcoming artist never fails to surprise herself. She goes on a daily search for emotions and sensations and lets herself be surprised by the diversity of a light that she captures with so much talent in her paintings. Keeping has an intense relationship with light. She manages to encapsulate a moment's glance and then offers it to us with the generosity of all its vivid and varied colours. ?An instant. Perhaps that is how we perceive light: a vibration, a resonance in the body, a yearning to become part of the ethereal. As if this was light's moment, as if light?were a prisoner of that instant. By creating minimal forms whipped up by a powerful energy, she adds just enough touches of colour to let you enter her paintings along a path of light that climbs towards the blue hills of Provence. Delighting in such clear nights, you want to sleep outside, or rest on the ochre wall of the Provençal farmhouse, jealously hidden behind foliage. Then it's the turn of the blustery wind: cypresses swaying, apricot trees swirling in autumn flames, scratching wild grass, rippling wheat fields ... .
And yet that powerful light is always there, arising out of nowhere throughout this journey. Keeping is able to capture the moment, its light, its depth and share it with us thanks to her infectious mastery. Keeping derives this ability from her passion but also from sheer hard work. From seeking to studies, she always paints by exploring new paths leading to perfectly mastered brush strokes, paintings that are balanced and vibrant in their colours and forms. ?Keeping's painting is quite simply an offering, a very powerful experience, a window that opens onto sensation. Suddenly, the world starts to vibrate.